Watching today's inspirational London Marathon, and fantasising about being there one day, I reflected that in fact some of the participants walk it - in part or in whole. While it's a very real dream of mine to actually run a marathon - preferably before I'm fifty - it's liberating to realise that the same "walk, jog or run" applies to 26.2 miles as it does to 3.1 miles - and that's what enabled me to attempt my first Race for Life last year. More than that, though: something in the back of my mind said you have done this already, you know. A distant memory stirred of a very long sponsored walk when I was at school: a grey, wet day (like today), and this plodder here refusing to give up, or take a lift. When was it? I burrowed around in some old files, and found it. 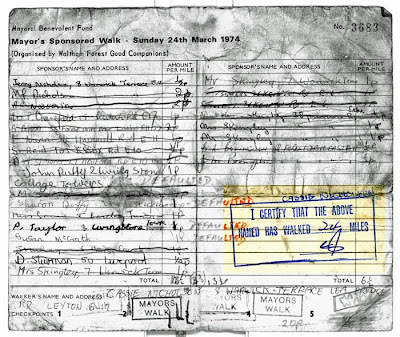 On Sunday, 24th March 1974 (I was just over 11 years old), I apparently took place in the Mayor's Sponsored Walk. I had a total sponsorship of 20p per mile (wow) and according to my form, I walked 24 miles. Not quite a marathon, but not far off it. And here's the proof. How long it took me, I've absolutely no idea - I would imagine in the region of 6-7 hours. However, I clearly did it, and knowing how stubborn I was then (what do you mean, then? ), I doubt that I would have cheated.